We make your child's birthday truly stand out from the crowd. Mesmerize your child and his or her guests with all the unique attractions The Adventuredome has to offer. Several exciting packages are available, with spaces set aside for your group in a specifically decorated party area. This year, treat your lucky boy or girl to a birthday that's pure adventure at The Adventuredome. 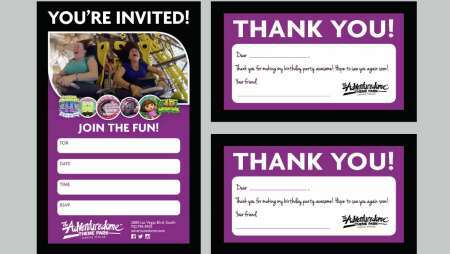 Download invitations and thank you cards. Take your next group outing to an outrageously entertaining new level! The Adventuredome was designed to wow!